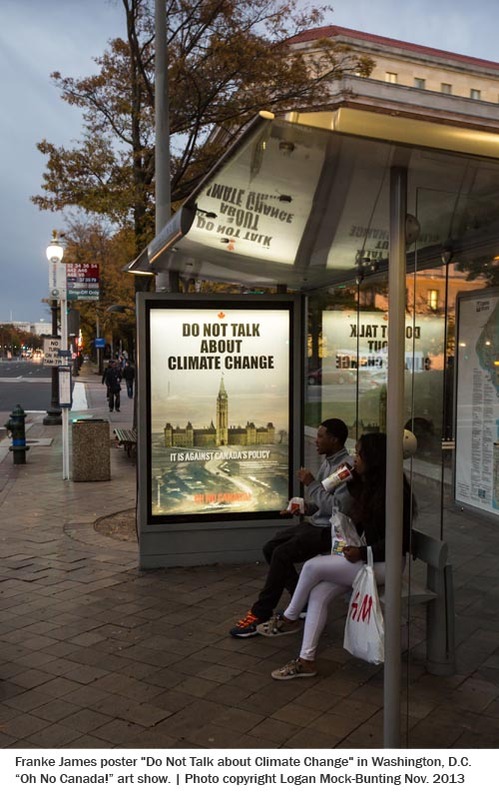 The Do Not Talk about Climate Change Posters are really getting around thanks to the power of Indiegogo crowd-funding! And DANG if it isn’t getting some people talking about climate change?! 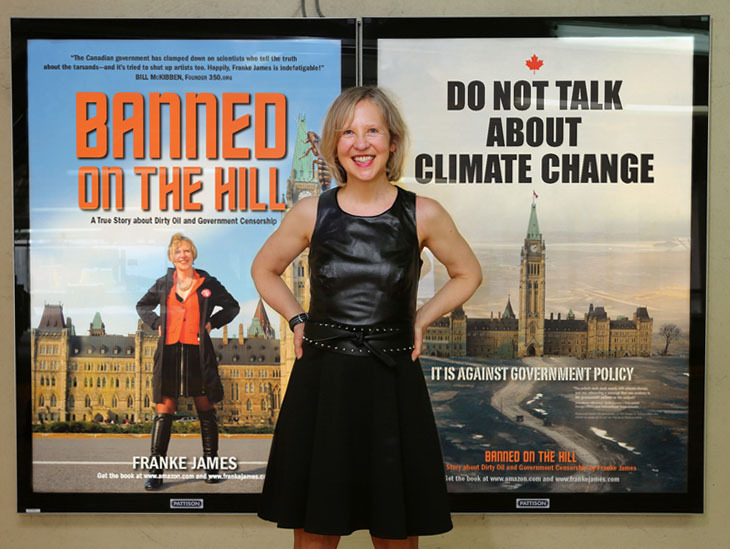 First the posters were in Ottawa, Ontario just a short walk from the PMO’s office at 80 Wellington Street (May/June 2013). Then they hopped over to enjoy the view at the Ferry Terminal in Halifax, Nova Scotia (Sept/Oct 2013). And now they are popping up in Calgary, Alberta — very close to the discounted hotels that the Conservatives are staying in for the Conservative Convention. 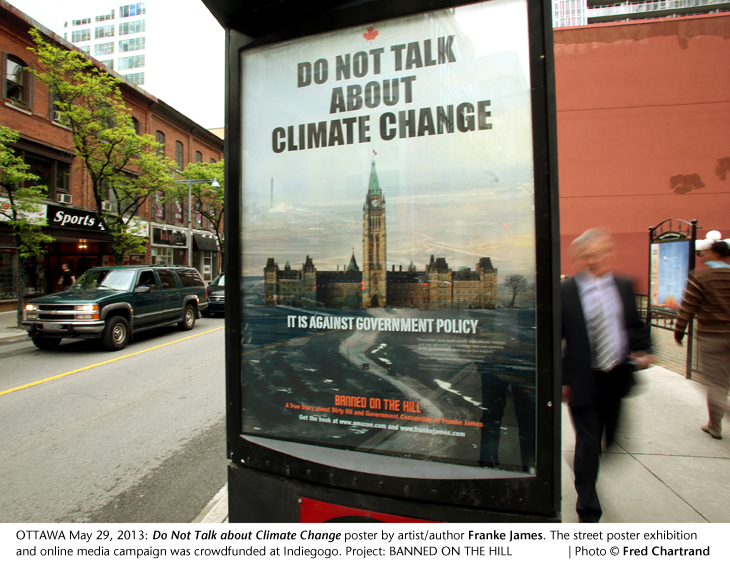 Franke James stands beside her “Do Not Talk about Climate Change” poster on October 31, 2013. The spokesperson’s words are memorably featured on my “Do Not Talk” poster. 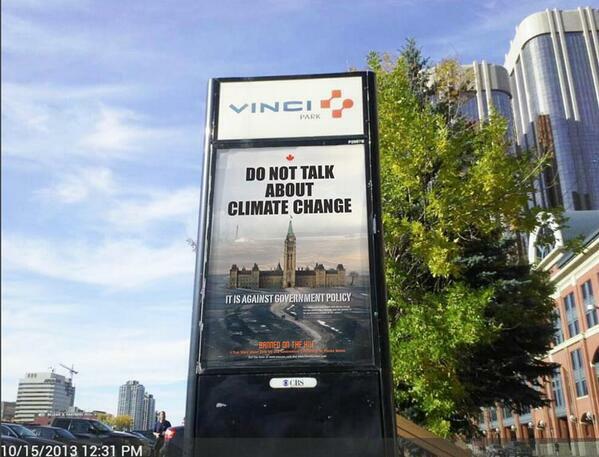 The image is of the Canadian Parliament buildings (in Ottawa, Ontario) dropped into the Mordor-like Alberta tar sands. 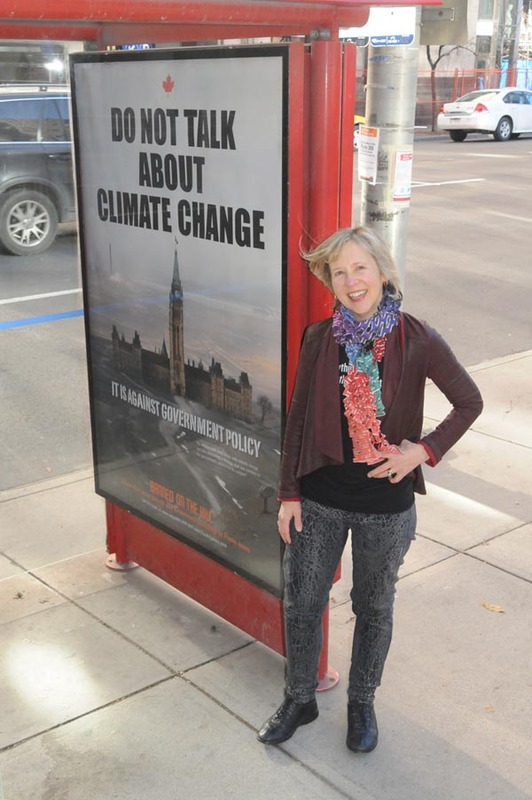 The street posters are part of my campaign to get Ottawa talking about climate change. A topic they really do not want people to talk about. They are so busy selling tar sands oil and silencing anyone who mentions the fact that bitumen is highly polluting and contributing to climate change, that it’s a challenge, a big one. 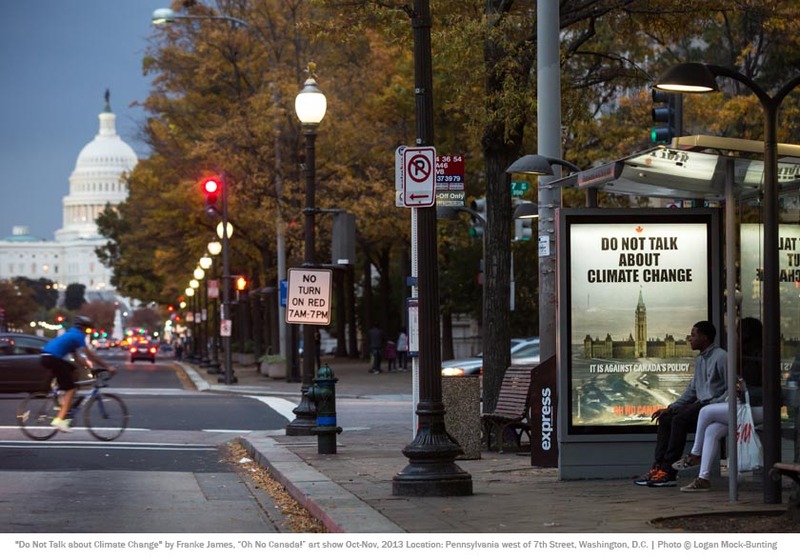 LOCATION: Do Not Talk About Climate Change: Pennsylvania west of 7th ST F/W Washington DC. SHOW: See the other posters in the Oh No Canada! art show. NEWS: Media articles about Oh No Canada! 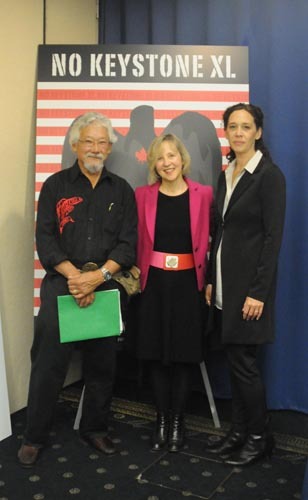 Thanks go to Indiegogo supporters, the NRDC, Sierra Club, and NWF for making the Washington “Oh No Canada!” show a reality! 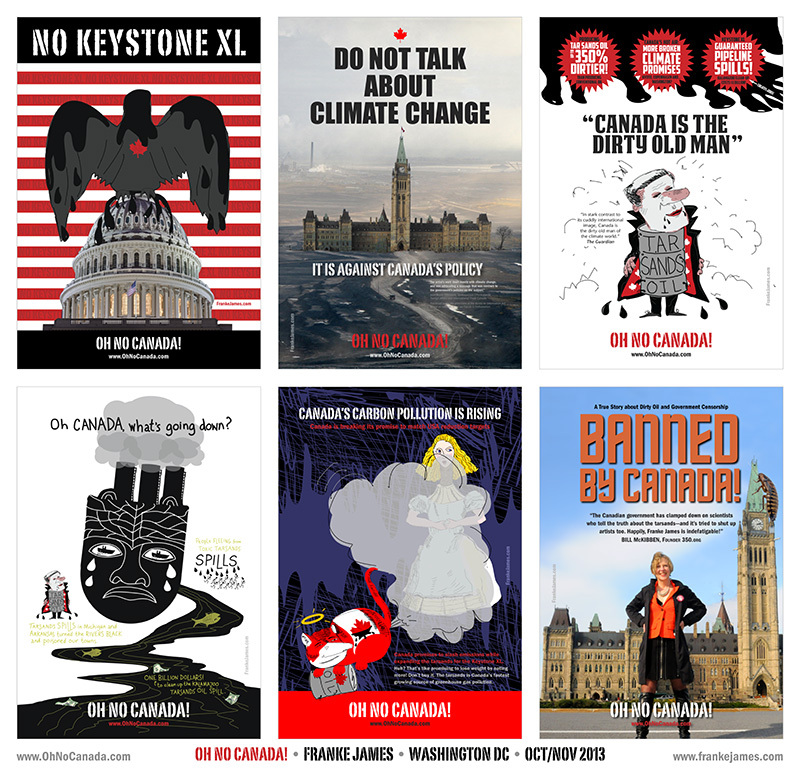 Help spread the word… Buy an Oh No Canada Poster. Leave a comment on the poster show. Share the news on Twitter, Facebook and Google Plus. Good show Franke! Great to see your art getting around. I really like the Capitol Hill image with the bold title. Then slowly I start to look around the lower half, and realize the wasteland that leads up to the front door. It is quite startling, and sadly a very accurate portrayal of why Mr. Harper is there. 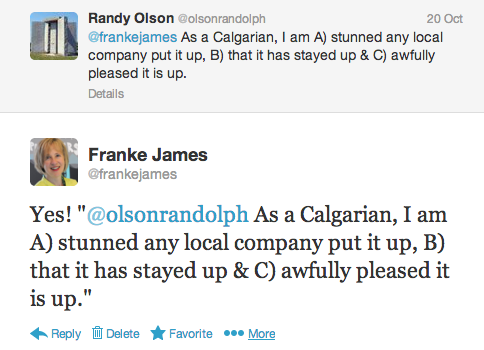 Thank you, Franke James for taking this conversation up a notch! I’m going to visit at least a couple of these sites with my 7 foot colorful Carbon Conversations banner in the next two weeks while your posters are up.